Air Pollution In Delhi: Around this time of the year, strong air in upper layers of atmosphere is blown into India from the arid middle-east nations. New Delhi: The lethal smog over Delhi has brought on its wings a full-blown tussle with its neighbouring states - at the heart of which is stubble burning by farmers in Haryana and Punjab. But scientists say the trouble has come from further afield - as far as Kuwait, Iran and Saudi Arabia. Around this time of the year, strong air in upper layers of atmosphere is blown into India from the arid middle-east nations. 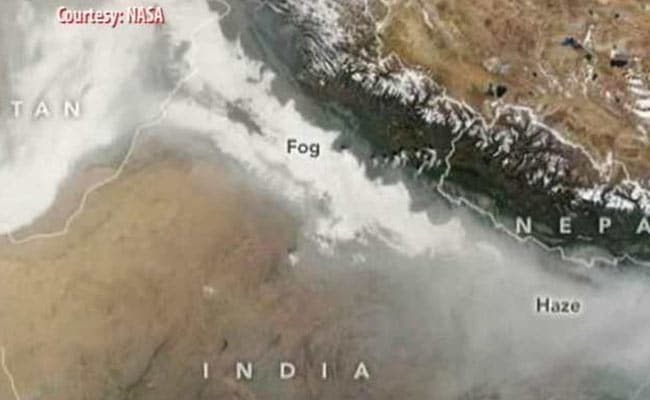 On its way to north India, the dust-laden winds cross the much-cooler Pakistan, where they collect water particles in the form of fog, and smoke from Punjab's burning fields. Heavier now, the winds sink and settle over Delhi and its surrounding areas, causing a noxious blanket. An aerial view from US space agency NASA makes the situation clear. This year, the particulate matter in the air has gone off charts, pushing up the level of pollutants to 10 times more than Chinese capital Beijing, known as the world's most polluted city. Doctors have called the smog a public health emergency and advised immediate "evacuation". Yesterday, the Central Pollution Control Board recorded an Air Quality Index or AQI of 486 on a scale of 500. On Tuesday, the average AQI had stood at 451 and on yesterday, at 478. A task force of the pollution control body, which met to review the measures taken to counter the situation, concluded that the pollution levels will drop on Saturday -- two notches below the current "emergency category". The Delhi government has announced a return of the odd-even road rationing scheme, which, it says will cut down vehicular pollution in half. Under the scheme, cars with license plates ending in an odd number and even-number are allowed to ply on alternate days. The Delhi government, on Wednesday, had announced a series of measures that included a ban on commercial trucks from entering the city unless they are transporting essential items till further orders. Construction activities have been stopped and car parking charges hiked four-fold to force residents to use public transport.